Star Wars 9 is www.mmdst.coming this Christmas. We're only 10 months out from seeing the return of Rey, Finn and Poe on the big screen. But we still don't have a trailer or even a title. It appears that many people have been pestering Mark Hamill for news on the first footage drop. As he's an active social media prankster, he decided to tease his fans with a sneak peek at his own personal Star Wars 9 trailer, and it proves he's pretty good at dad jokes. Though, for anyone with a good memory, you'll also soon discover that Mark Hamill is good at recycling his own jokes. Way back in December, around the one year anniversary of The Last Jedi, many fans believed they were going to get the first Star Wars 9 trailer. So Mark Hamill, ever the jolly prankster, pulled a similar joke. You can't fool us Mark. If you're going to continue trolling fans, you might want to get some new material. Related: Star Wars 9 Art Leak Reveals New Characters, Lando & C-3PO with a Bowcaster? We can't blame Mark Hamill for returning to the same joke again. It's gold, and still pretty funny. 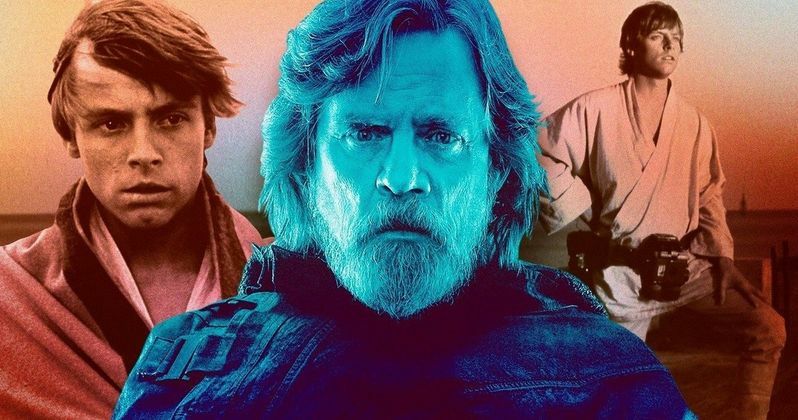 Star Wars 9 is confirmed to be the end of the Skywalker family saga. But we may not actually get much of Luke. In recent interviews, Hamill has teased that he is only getting a cameo. And it will probably be as a Force Ghost, as it's confirmed that he died in The Last Jedi. But there will probably be a surprise or two on the way. As for when we'll really see the Star Wars 9 trailer? It was announced last week that a Star Wars 9 panel will officially kick off Star Wars Celebration. Right now, director J.J. Abrams is the only confirmed attendee for this epic Q&A sessions. It's heavily speculated that this is the time and place of the first trailer drop and we should also get a title reveal. None of that has been confirmed, but that's how it has played out in the past. Though, one year, everyone thought they were getting a trailer, and instead, they just got a behind-the-scenes sizzle reel. Which was cool. But imagine how disappointed everyone will be if that's all J.J. Abrams brings to Chicago. By now in the timeline for the previous two movies, we'd already seen trailers for The Force Awakens and The Last Jedi. Star Wars 9 is playing the marketing game a little differently. As it's the climax of one of the most influential and important movie franchises of all times, this is being handled with kid gloves, especially considering that half the fan base didn't appreciate The Last Jedi. We only have a a few more weeks to go before we get something, with Star Wars Celebration kicking off April 12. The Star Wars 9 panel will ignite the big celebration. This 'hilarious' twitter joke was provided by Mark Hamill. Keri Russell Confirms Cool Star Wars 9 Costume, Did It Already Leak?